"First coming" redirects here. For the first coming of the messiah in Judaism, see Messiah in Judaism. For the birth of Jesus of Nazareth, see Nativity of Jesus. For general uses, see Incarnation. In Christian theology, the doctrine of the incarnation holds that Jesus, the preexistent divine Logos (Koine Greek for "Word") and the second hypostasis of the Trinity, God the Son and Son of the Father, taking on a human body and human nature, "was made flesh" and conceived in the womb of Mary the Theotokos (Greek for "God-bearer"; Latin: Mater Dei, lit. 'Mother of God'). The doctrine of the incarnation, then, entails that Jesus Christ is fully God and fully human, his two natures joined in hypostatic union. In the incarnation, as traditionally defined by those Churches that adhere to the Council of Chalcedon, the divine nature of the Son was united but not mixed with human nature in one divine Person, Jesus Christ, who was both "truly God and truly man". This is central to the traditional faith held by most Christians. Alternative views on the subject (See Ebionites and the Gospel of the Hebrews) have been proposed throughout the centuries (see below), but all were rejected by mainstream Christian bodies. An alternative doctrine known as "Oneness" has been espoused among various Pentecostal groups (see below). The incarnation is commemorated and celebrated each year at Christmas, and also reference can be made to the Feast of the Annunciation; "different aspects of the mystery of the incarnation" are celebrated at Christmas and the Annunciation. The noun incarnation derives from the ecclesiastical Latin verb incarno, itself derived from the prefix in- and caro, "flesh", meaning "to make into flesh" or, in the passive, "to be made flesh". The verb incarno does not occur in the Latin Bible but the term is drawn from the Gospel of John 1:14 "et Verbum caro factum est" (Vulgate), King James Version: "and the Word was made flesh". Incarnation refers to the act of a pre-existent divine being, the Son of God, in becoming a human being. While all Christians believed that Jesus was indeed the Son of God, "the divinity of Christ was a theologically charged topic for the Early Church." Debate on this subject occurred during the first four centuries of Christianity, involving Jewish Christians, Gnostics, followers of Arius of Alexandria, and adherents of Pope Alexander of Alexandria, among others. Ignatius of Antioch taught that "We have also as a Physician the Lord our God, Jesus the Christ, the only-begotten Son and Word, before time began, but who afterwards became also man, of Mary the virgin." Justin Martyr argued that the incarnate Word was pre-figured in Old Testament prophecies. Eventually, teaching of Alexander, Athanasius, and the other Nicene Fathers, that the Son was consubstantial and coeternal with the Father, were defined as orthodox dogma. All divergent beliefs were defined as heresies. This included Docetism, Arianism, Nestorianism, and Sabellianism. 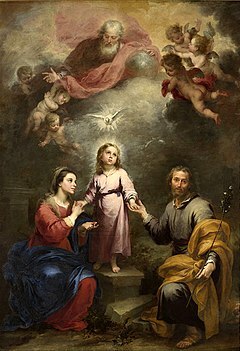 The incarnation implies three facts: (1) The Divine Person of Jesus Christ; (2) The Human Nature of Jesus Christ; (3) The Hypostatic Union of the Human with the Divine Nature in the Divine Person of Jesus Christ. Without diminishing His divinity, He added to it all that is involved in being human. In Christian belief it is understood that Jesus was at the same time both fully God and fully human, two natures in one person. The body of Christ was therefore subject to all the bodily weaknesses to which human nature is universally subject; such are hunger (Matt.4:2), thirst (John 19:28), fatigue (John 4:6), pain, and death. They were the natural results of the human nature He assumed. The Athanasian (5th century) and Nicene Creeds contain a comprehensive traditional definition of the incarnation. The incarnation is central to Catholicism. The Catechism of the Catholic Church gives paragraphs 461-463 to the incarnation and cites several Bible passages to assert its centrality (Philippians 2:5-8, Hebrews 10:5-7, 1 John 4:2, 1 Timothy 3:16). The link between the incarnation and the atonement within systematic theology is complex. Within traditional models of the atonement, such as Substitution, Satisfaction or Christus Victor, Christ must be human in order for the sacrifice of the cross to be efficacious, for human sins to be "removed" and/or "conquered". In his work The Trinity and the Kingdom of God, Jürgen Moltmann differentiated between what he called a "fortuitous" and a "necessary" incarnation. The latter gives a soteriological emphasis to the incarnation: the Son of God became a man so that he could save us from our sins. The former, on the other hand, speaks of the incarnation as a fulfilment of the Love of God, of his desire to be present and living amidst humanity, to "walk in the garden" with us. Moltmann favours "fortuitous" incarnation primarily because he feels that to speak of an incarnation of "necessity" is to do an injustice to the life of Christ. Moltmann's work, alongside other systematic theologians, opens up avenues of liberation Christology. During the Reformation, Michael Servetus taught a theology of the incarnation that denied trinitarianism, insisting that classical trinitarians were essentially tritheists who had rejected Biblical monotheism in favor of Greek philosophy. The Son of God, Servetus asserted, is not an eternally existing being, but rather the more abstract Logos (a manifestation of the One True God, not a separate person) incarnate. For this reason, Servetus refused to call Christ the "eternal Son of God" preferring "the Son of the eternal God" instead. In describing Servetus' theology of the Logos, Andrew Dibb (2005) comments: "In Genesis God reveals Himself as the Creator. In John He reveals that He created by means of the Word, or Logos. Finally, also in John, He shows that this Logos became flesh and 'dwelt among us'. Creation took place by the spoken word, for God said 'Let there be…' The spoken word of Genesis, the Logos of John, and the Christ, are all one and the same." Condemned by both the Roman Catholic and Protestant churches on account of his heterodox Christology, Servetus was burnt at the stake for heresy in 1553, by the Reformed Protestants in Geneva, Switzerland. The French reformer John Calvin, who asserted he would ensure the death of Servetus if he set foot in Geneva because of his non-Reformed views on the Trinity and the sacrament of baptism, requested he be beheaded as a traitor rather than burned as a heretic, but the authorities insisted on executing Servetus by fire. Post-Reformation Arians such as William Whiston often held a view of the incarnation in keeping with the personal pre-existence of Christ. Whiston considered the incarnation to be of the Logos Who had pre-existed as "a Metaphysick existence, in potentia or in the like higher and sublimer Manner in the Father as His Wisdom or Word before His real Creation or Generation.". Servetus rejected Arianism because it denied Jesus' divinity so it is certain that he would have also rejected Socinianism as a form of Arianism which both rejects that Jesus is God, and, also that Jesus consciously existed before His birth, which most Arian groups accept. Fausto Sozzini and writers of the Polish Brethren such as Samuel Przypkowski, Marcin Czechowic and Johann Ludwig von Wolzogen saw the incarnation as being primarily a function of fatherhood. Namely that Christ was literally both 'Son of Man' from his maternal side, and also literally 'Son of God' on his paternal side. The concept of the incarnation —"the Word became flesh and dwelt among us"— was understood as the literal word or logos of Ps. 33:6 having been made human by a virgin birth. Sozzini, Przypkowski and other Socinian writers were distinct from Servetus in stating that Jesus having "come down from heaven" was primarily in terms of Mary's miraculous conception and not in Jesus having in any literal sense been in heaven. Today the number of churches with Socinian Christology is very small, the main group known for this are the Christadelphians, other groups include CoGGC and CGAF. Modern Socinian or "Biblical Unitarian" writers generally place emphasis on "made flesh" not just meaning "made a body", but incarnation (a term these groups would avoid) requiring Jesus having the temptable and mortal nature of His mother. In contrast to the traditional view of the incarnation cited above, adherents of Oneness Pentecostalism believe in the doctrine of Oneness. Although both Oneness and traditional Christianity teach that God is a singular Spirit, Oneness adherents reject the idea that God is a Trinity of persons. Oneness doctrine teaches there is one God who manifests Himself in different ways, as opposed to a Trinity, where God is seen as one being consisting of three distinct persons. To a Oneness Pentecostal, Jesus is seen as both fully divine and fully human. The term Father refers to God Himself, who caused the conception of the Son in Mary, thus becoming the father of the child she bore. The term Son refers to the fully human person, Jesus Christ; and the Holy Ghost refers to the manifestation of God's Spirit inside of and around His people. Thus the Father is not the Son — and this distinction is crucial — but is in the Son as the fullness of His divine nature. Traditional Trinitarians believe that the Son always existed as the eternal second person of the Trinity; Oneness adherents believe that the Son did not come into being until the incarnation, when the one and only true God took on human form for the first, last and only time in history. According to Mormon theology two of the three distinct divine beings of their godhead have perfected, glorified, physical bodies, namely God the Father-Elohim and God the Son-Jehova. The Mormon godhead of Father, the Son, and the Holy Ghost are not said to be one in substance or essence; instead, they remain three separate beings, or personages. This conception differs from the traditional Christian Trinity in which only one of the three divine persons, God the Son, had an incarnated physical body, and Jehova has not. It also differs totally from the Jewish tradition of ethical monotheism in which Elohim (Hebrew: אֱלֹהִים‎) is a completely different conception. ^ The Seven Ecumenical Councils, from the Nicene and Post-Nicene Fathers, vols. 2–14 (CCEL.org) Contains detailed statements from each of these councils. The First Council of Nicaea, Council of Ephesus and Council of Chalcedon are the "First", "Third" and "Fourth" Ecumenical Councils, respectively. ^ McKim, Donald K. 1996. Westminster dictionary of theological terms. Louisville, Kentucky: Westminster John Knox Press. p. 140. ^ Divine Liturgy of St. James. Translated by James Donaldson. From Ante-Nicene Fathers, Vol. 7. Edited by Alexander Roberts, James Donaldson, and A. Cleveland Coxe. (Buffalo, New York: Christian Literature Publishing Co., 1886.) Revised and edited for New Advent by Kevin Knight. ^ 'De trinitatis erroribus', Book 7. ^ Oneness doctrine is explained in detail in UPCI minister Dr. David K. Bernard's The Oneness of God Archived 2008-02-16 at the Wayback Machine, David K. Bernard (1994-09-30);The Oneness View of Jesus Christ (Kindle Locations 362-367). World Aflame Press. Kindle Edition; David S. Norris (2013-11-12). I AM: A Oneness Pentecostal Theology (Kindle Locations 190-192). Word Aflame Press. Kindle Edition. This article incorporates text from a publication now in the public domain: Herbermann, Charles, ed. (1913). "The Incarnation". Catholic Encyclopedia. New York: Robert Appleton. This page was last edited on 12 March 2019, at 00:10 (UTC).